The Wellington Boys and Girls Club is holding its 34th Annual Golf Classic on October 10, 2015, at The Wanderers Club, in Wellington. This year’s classic tees off at 8:30 a.m., with a “shotgun start.” Firm partner, Mickey Smith, is on the board for the Wellington Club and is a co-chair of the event. Mickey says, “The Firm is honored to be a major sponsor of the golf classic. It is not only a great fundraiser for the Wellington Boys and Girls Club, it is also a lot of fun. It is humbling to consider that honorary chairman, Ed Portman, has been working extremely hard on this golf classic for each of its 34 years.” Although foursomes are filling up quickly, there are still openings, and there are other sponsorship opportunities available. Unquestionably, it is for a great cause. For more information go to:www.BGCPBC.org. 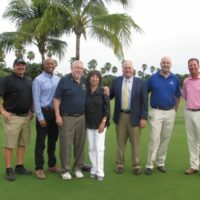 Pictured left to right in the photo recently taken at The Wanderers Club are Wellington board members and golf committee co-chairs Ray Mooney, Elliot Bonner, Ed Portman, Julie Kime, Mickey Smith and Todd Barron (president), along with Jeff Fraim , head golf professional at The Wanderers Club.